The 22" (21.5" viewable) ViewSonic® TD2220 is a multitouch Full HD LED backlit monitor with 1920x1080 resolution, integrated speakers, DVI & VGA inputs and VESA mountable design. It has 20,000,000:1 MEGA Dynamic Contrast Ratio for sharp crisp images, SRS Premium Sound® for crystal clear sound and Ecomode for up to 40%* energy savings come standard in the new 22" (21.5" viewable) offering. Perfect for both commercial and consumer applications, the TD2220 supports the USB HID Touch driver and is fully compatible with Windows® 8. 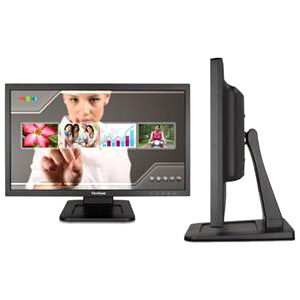 The TD2220 is a one-stop solution for your multi-touch monitor needs. You will also get the most out of your investment with ViewSonic's strongest pixel performance guarantee, 3-year limited warranty, as well as ENERGY STAR® and EPEAT Silver certifications.